Coat of arms of the Lütke family (ru) of 1866, in the Baltic Coat of arms book [et] by Carl Arvid von Klingspor [de] in 1882. Friedrich Benjamin Graf von Lütke (Russian: Фёдор Петро́вич Ли́тке, Fyodor Petrovich Litke; 28 September [O.S. 17 September] 1797 – 20 August [O.S. 8 August] 1882), more commonly known by his Russian name Fyodor Litke, was a Baltic German navigator, geographer, and Arctic explorer. He became a count in 1866, and an admiral in 1855. He was a corresponding member (1829), Honorable Member (1855), and President (1864) of the Russian Academy of Science in St. Petersburg. He was also an Honorable Member of many other Russian and foreign scientific establishments, and a corresponding member of the French Academy of Science in Paris. Friedrich came from the Lütke family (ru) of Brandenburgish origin and originated in Jüterbog. Count Lütke's grandfather was Johann Philipp von Lütke, a German Lutheran preacher and writer on physical science and theology. In 1745, Johann went from Germany to Moscow as pastor of a Lutheran parish in order to spread Lutheranism to Russia and Baltic provinces. As a youth, Friedrich attended a Lutheran German-speaking school. His maternal language was German and he always spoke Russian with a German accent. He remained a practicing Lutheran. A book, in English, about Count Lütke, published in 1996 by The University of Alaska, entitled Fedor Petrovich Litke by A.I. Alekseev, ISBN 0-912006-86-2, is a 262-page biography of this 19th-century Russian scientist. This book was originally published in Russian in Moscow in 1970. Lütke started his naval career in the Imperial Russian Navy in 1813. He took part in Vasily Golovnin's world cruise on the ship "Kamchatka" from 1817 to 1819, where one of his crewmates was Ferdinand Wrangel. Then from 1821 to 1824, Lütke led the expedition to explore the coastline of Novaya Zemlya, the White Sea, and the eastern parts of the Barents Sea. From August 20, 1826 to August 25, 1829, he headed the world cruise on the ship "Senyavin", sailing from Kronstadt and rounding Cape Horn. At the beginning, he was accompanied from Copenhagen and the Baltic Sea by Capt. Staniukovich who was in command of the sloop Möller. The scientific team included Heinrich von Kittlitz (ornithologist), Karl Heinrich Mertens (botanist) and Alexander Postels (mineralogist). During this voyage he described the western coastline of the Bering Sea, the Bonin Islands off Japan, and the Carolines, although he discovered only one new island (Eauripik, the expedition is noted for having visited every inhabited island in the Caroline Islands (with the exception of Yap) and for compiling an extensive ethnographic account. In particular, the expedition spent three weeks in the Nomoi Islands, which had been last visited by Pedro Quiros in 1565. The team collected over 8000 plant, animal and mineral samples. In 1835, Lütke was appointed by Tsar Nicholas I of Russia as tutor of his second son, Grand Duke Constantine Nicholaievich of Russia. Lütke was the first one to come up with the idea of a recording tide measurer (1839). They were built and installed along the coastlines of the Arctic Ocean and the Pacific Ocean in 1841. Lütke was one of the organizers of the Russian Geographical Society and its president in 1845–1850 and 1857–1872. He was appointed Chairman of the Naval Scientific Committee in 1846. Lütke was a commander-in-chief and a military governor of the ports of Reval (today's Tallinn) and later Kronstadt in 1850–1857. In 1855, Litke became a member of the Russian State Council (Государственный совет in Russian; a legislative entity that predated the Duma, which came into existence only in 1906). In 1873, the Russian Geographical Society introduced the Lütke gold medal. A cape, peninsula, mountain and bay in Novaya Zemlya, as well as a group of islands in Franz Josef Land, Baydaratskaya Bay, and the Nordenskiöld Archipelago and a strait between Kamchatka and Karaginsky Island, as well as two Russian icebreakers were named after him. Nereocystis luetkeana was named after him by Mertens (first as Fucus luetkeanus) and then described by Postels and Ruprecht. Count Lütke's portrait on a 1947 Soviet postage stamp in a series issued to commemorate the centennial of the Russian Geographical Society. During his voyage round the world on the Russian corvette Seniavin Lütke arrived at Sitka in 1827. From there he sailed to Unalaska, surveying the Pribilof Islands, St. Matthew Island and the Commander Islands, before arriving to Petropavlovsk, a harbor which he used as a base for further surveys along the Siberian coast all the way to St. Lawrence Bay by the Bering Strait. After finally returning to Kronstadt Litke published a 3-volume account of his explorations with atlases in Russian and in French, the latter being published in Paris and entitled Voyage autour du monde, : exécuté par ordre de sa majesté l’empereur Nicolas Ier, sur la corvette Le Séniavine, dans les années 1826, 1827, 1828 et 1829, par Frédéric Lutké, ... commandant de l’expédition. Partie historique, avec un atlas, litographié d’après les dessins originaux d’Alexandre Postels et du baron Kittlitz. Traduit du russe sur le manuscrit original, sous les yeux de l’auteur, par le conseiller d’état F. Boyé. Tome I–III. Very few copies were printed and especially the Russian original work with its nautical part became an extremely rare item. The nautical volume contains hydrographic and geographic details on the then little-known Bering Sea and Alaska obtained not only from Lütke's own work but also from various previously unpublished Russian sources. Even though there were errors and delays in the publication that didn't satisfy the author, Lütke's work is a valuable source of information on the evolution of geographic knowledge of Alaska and the Bering Sea. When W. H. Dall published an index for the book, Lütke's name was given as "Lutke", which reflects the spelling under which the book was published in Paris. Certain geographic features of the Alaskan coast, like the Walrus and Kritskoi Islands, Kudobin Islands and numerous other features in the Aleutians, were named by Count Lütke in the maps that were subsequently published. The landhead now named Cape Lutke in Alaska was named after this Russian explorer by the Imperial Russian Hydrographic Service in 1847. The Litke Deep is named in his honour. ^ Klingspor 1882, p. 67. ^ a b Quanchi, Max (2005). Historical Dictionary of the Discovery and Exploration of the Pacific Islands. The Scarecrow Press. p. 100. ISBN 0810853957. ^ "Feature Detail Report for: Cape Lutke". Geographic Names Information System. United States Geological Survey. Ferdinand Friedrich Georg Ludwig Freiherr von Wrangel was a Baltic German explorer and seaman in the Imperial Russian Navy, Honorable Member of the Saint Petersburg Academy of Sciences, a founder of the Russian Geographic Society. He is best known as chief manager of the Russian-American Company, in fact governor of the Russian settlements in present-day Alaska. Vasily Mikhailovich Golovnin 19 April [O.S. 8 April] 1776, Gulyniki, Ryazan Oblast, Russia 11 July [O.S. 29 June] 1831, Saint Petersburg, Russia, was a Russian navigator, Vice Admiral, and corresponding member of the Russian Academy of Sciences (1818). Alexander Filippovich Postels, was a Baltic German of Russian citizenship naturalist, mineralogist and artist. 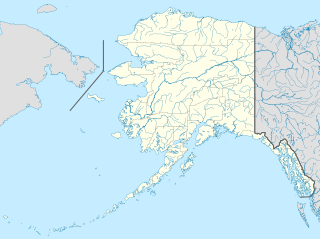 The Kudobin Islands are a group of small islands in the Bering Sea, near the coast of Alaska, 13 miles (21 km) West of Port Moller; Bristol Bay Low. The group includes a cluster of other small coastal islands, Walrus and Kritskoi Islands, forming a geographical whole. Cape Chaplin or Cape Chaplino is a cape pointing eastward in the Bering Sea in the Chukotka Autonomous Okrug of the Russian Federation. The Saint Lawrence Bay is a bay in the Bering Sea on the eastern coast of the Chukotka Peninsula, Russian Federation. Cape Lutke is a headland on Unimak Island, the largest island in the Aleutian Islands chain of the U.S. state of Alaska. It is located on the southern central coast of the island. Karl Heinrich Mertens, was a German botanist and naturalist, and son of the botanist Franz Carl Mertens.